At Little Robes Royale we are proud to support the summit of faith celebrated by Catholics & Christian’s all over the world. But as we began our journey of designing our outfits, it was important for us to study, why this day is so important – enabling us to offer respect, love and support to all our first communion customers. The faithful believe that the Holy Eucharist is the source and summit of their faith: it is the Body, Blood, Soul, and Divinity of their Lord and Saviour Jesus Christ. The Eucharist is at the heart of ‘Christian initiation’, together with Baptism and Confirmation, and it constitutes the source of the Church’s life itself. From this Sacrament of love, in fact, flows every authentic journey of faith, of communion, and of the witness they take to certify their belief. We were of course surprised to find out that not all churches celebrate communion in the way we have come to view it, but the practise remains in some form or another. The sacrament of First Communion is an important tradition for Catholic families and individuals. For Catholics, Holy Communion is the third of seven sacraments received. It occurs only after receiving Baptism, and once the person has reached the age of reasonable understanding, which is normally around the ages of 7 to 10 years old. In 1910, Pope Pius X issued the decree Quam singulari, which changed the age at which First Communion is taken to 7 years old. Previously, local standards had been 10 or 12 or even 14 years old. Interestingly Byzantine Catholics (Eastern Rite) celebrate the sacraments of baptism, confirmation (Chrismation), and Holy Communion on the same day as an infant’s baptism. There are many traditions of celebration that commemorate the completion of the First Communion. These celebrations usually include large family gatherings and parties to celebrate the event. The first communicant wears special clothing. The clothing is often white to symbolize purity, but not in all cultures. Often, a girl wears a grand gown or dress and a veil attached to a chaplet of flowers or some other hair decoration such as a Tiara. In some communities, girls commonly wear dresses that are family heir looms passed down to them from sisters, mothers or even grandmothers. Boys may wear a suit and tie, tuxedo, their Sunday best, or national dress, with embroidered arm bands worn on the left arm and occasionally white gloves. In many Latin American countries, boys wear military-style dress uniforms with gold braid aiguillettes. In Switzerland, both boys and girls wear plain white robes with brown wooden crosses around their necks. In Spain, Germany, Luxembourg, Austria, and Guam, girls are dressed up as little brides, although this has been partly replaced by albs, which is a simple floor length white garment in recent times. In Scotland, boys traditionally wear kilts and other traditional Scottish dress which accompany the kilt. In the Philippines, First Communion services often occur on or around the Feast of the Immaculate Conception (the country’s patron saint), with boys wearing either the Barong Tagalog or semi-formal Western dress, and girls a plain white dress and sometimes a veil. Many families also have formal professional photographs taken in addition to candid snapshots in order to commemorate the event. Some churches arrange for a professional photographer after the ceremony. 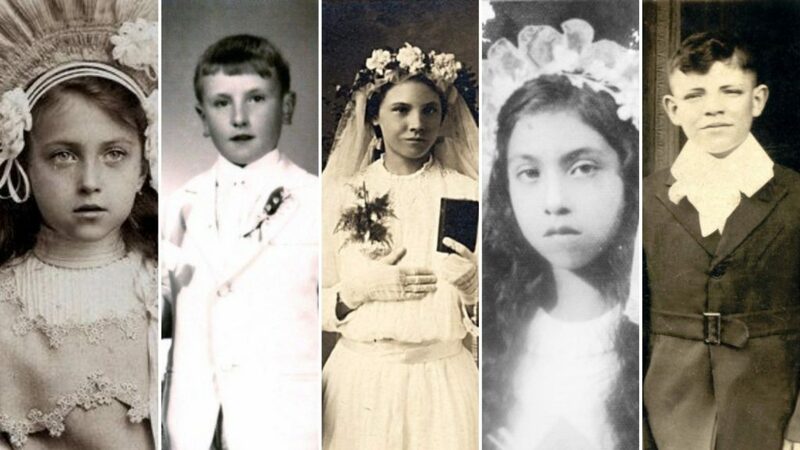 Where & How Is First Communion Celebrated? The First Holy Communion is held in church within a special ‘First Holy Communion Mass’ and involves several children (the communicants) receiving the Sacrament at once, in a service that is open to the whole community, this was a most beautiful representation of inclusion, as many of our staff have attended communion Mass, and were welcomed in wearing hijabs, and various other forms of religious attire. At a Holy Communion Mass, it is common to see family, Godparents and friends of the family invited to celebrate, along with the church-going community that gathers together each week. It should however be mentioned that anyone attending a First Holy Communion Mass should dress appropriately for church – modestly and smartly but not over-the-top. Sports jackets for men or smart shirt and trousers are perfect, and a pretty dress or a top and skirt for ladies is ideal. The Mass will last for approximately an hour though this will vary, sometimes up to 90 minutes. It will consist of prayers, hymns, readings, bidding prayers and the actual Communion. Children will receive their Holy Communion first, and then any other worshippers will be invited to receive Communion too. If you are not Catholic you can just stay seated at this point or even asked to be blessed. If the family still have the baptismal candle that was held for the child by the Godparents at their baptism then they are often encouraged to bring that along. The lighting of candles is frequently part of the service. If you’ve been invited to a First Holy Communion, enjoy sharing this special day with family or friends. You won’t be able to take photos in the Church but make sure you get plenty outside after the service for the Communion photo album. There is usually a ‘Communion breakfast’ afterwards for everyone to get together and celebrate. Often the Church will provide light refreshments after the service and then you will all move on to a gathering at home or in a local venue. It is a lovely idea to give a card and a Communion gift that the child can keep to remember their special day forever.